A former bootlegger is now the prosperous owner of a popular nightclub. A hustling promoter manages to pass off a young singer as the heir to a fortune and gets her booked at the club. This musical from Universal looks cut down to its running time of just 64 minutes. In the finale we see evidence of musical numbers that never appear. That being said, what's left is enjoyable if minor. Former MGM star Kitty Carlisle plays a singer who gets fired from her job in the Blue Room after wily manager William Frawley cons the dopey owner (Leo Carrillo) into booking Allan Jones and his band by letting him think Jones is rich and that his contract will entitle him to half Jones' wealth. It's a con conning a con. But Carlisle won't go away and takes a job as a waitress because she smells a rat. She also falls for Jones and eventually joins the show for a big wartime finale with the King Sisters and Alvino Rey (and his band). 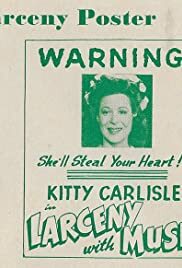 Kitty Carlisle is very good though this would prove to be her last starring film role. Jones is OK but rather unlikely as a big-band singer. Frawley and Carrillo are funny. Others in the cast include Gus Schilling, Lee Patrick, Murray Alper, Sig Arno, Samuel S. Hinds, and John Hamilton. The musical is forgettable but nicely done.